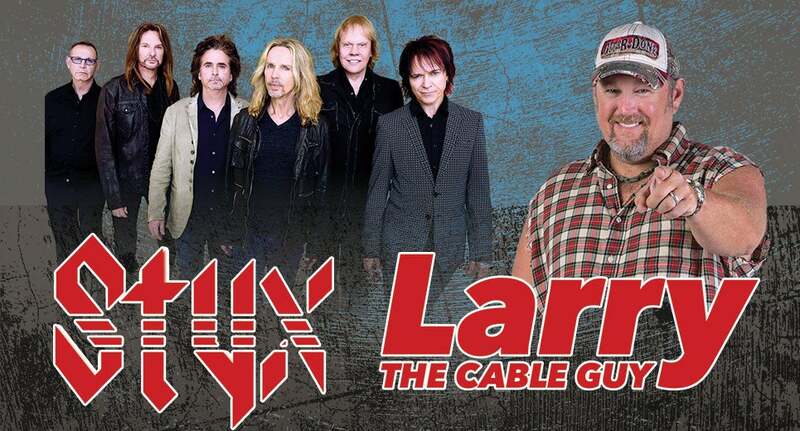 For one night only, Legendary Platinum rockers STYX and comedy legend Larry the Cable Guy are joining forces for the first time ever to rock and GIT-R-DONE. Billed as “Laugh. Rock. Seriously.” Two forces come together on stage for one unforgettable night of hits and jokes. STYX has the unique distinction of being the first band in rock history to have four consecutive certified multimillion-selling albums in a row: 1977’s THE GRAND ILLUSION, 1978’s PIECES OF EIGHT, 1979’s CORNERSTONE, and 1981’s PARADISE THEATRE. STYX draws from over four decades of barn burning chart hits, joyous singalongs, and hard-driving deep cuts. STYX set covers a wide range of stylistic cornerstones. After 14 years, STYX’s sonically sweet 16th studio album and its most ambitious, most challenging, and most rewarding album to date, THE MISSION, was finally released June 16, 2017, on the band’s label, Alpha Dog 2T/UMe. It debuted on various Billboard charts, including: #6 Top Rock Albums, #11 Physical Albums, #11 Vinyl Albums, #13 Current Albums, #14 Top Albums, #Retail, #17 Mass Merch/Non-Traditional, #29 Digital Albums, and #45 Top 200 Albums (includes catalog and streaming). A special two-disc reissue of THE MISSION was released on July 27, 2018 via Alpha Dog 2T/UMe, which includes a CD of the original album, as well as a Blu-ray of THE MISSION mixed in 5.1 Surround Sound by singer/guitarist Tommy Shaw and producer Will Evankovich accompanied by stunning visualizations for each of the album’s 14 songs based on the album artwork. Other extras on the Blu-ray include: “The Making of The Mission Documentary” of exclusive interviews of SHAW and Evankovich, four music videos—“Gone Gone Gone” (official video), “Gone Gone Gone” (video created by NASA), “Radio Silence” (lyric video) and “Radio Silence” (live video from Syracuse, NY)—and three hi-res audio playback modes. Doors open at 60 minutes before start of show.